So how do you capture something of the spirit of an interesting Aussie in just 17 syllables? You write about them in Haiku Poetry of course! But wait; There's more... 221 more in fat. In total, 222 pithy little Morsels about 222 Aussies - some famous, some infamous, some quiet achievers, some with more front than Myers, some alive, some dead, some nice, and some politicians. then there's some animals, some TV characters and one Aussie who didn't even exist. Raelene Laurie Newall delights with her salute to Aussies of all kinds. With water-colour caricatures painted by the author as well, this little book is sure to bring you some "uh huh!" moments, some eye-rolling and some fond memories. 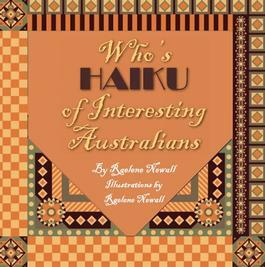 Be the first person to tell us what you think about Who&apos;s Haiku of Interesting Australians and you'll save $5 on your next purchase!